California Academy of Sciences booth: When it returns to Golden Gate Park in 2008, the academy's new home will be the largest public green building in the U.S. -- itself an exhibit to how we can stop global warming. Global Warming Discovery, as seen in the AAAS stage show, is also a public program at the California Academy of Sciences-- where outstanding high school interns regularly present the demonstration to the public. The New Academy: LEED Platinum Green Building. Exploratorium stage show at the AAAS Family Science Days. The Exploratorium broadcast live web casts on Climate Change from the American Geophysical Union conference in San Francisco: like the 2007 AAAS Conference, an example of the wonderful things that happen when science conferences and science museums work together to connect with the public. 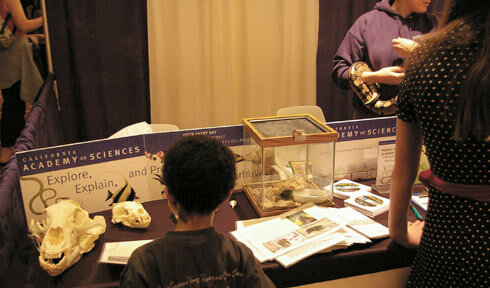 AAAS's Family Science Days, with dozens of booths, was attended by thousands on Saturday and Sunday February 17 & 18, 2007. 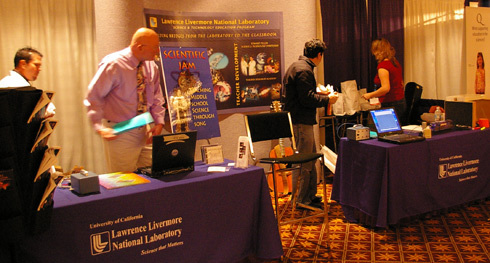 These web pages focus on those booths with material relating to climate change, energy and global warming solutions. 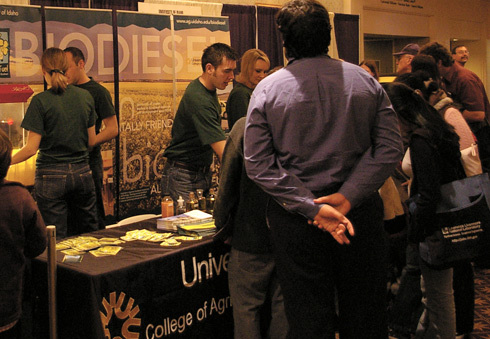 The University of Idaho's booth included a demo on the production of biodiesel fuel. University of Idaho's biodiesel car. Copyright ©2007 ClimateChangeEducation.Org. Photos all rights reserved.